'Calling and Responding to Nature' is on display at the Clackamas Community College Wilsonville campus until Feb. 22. 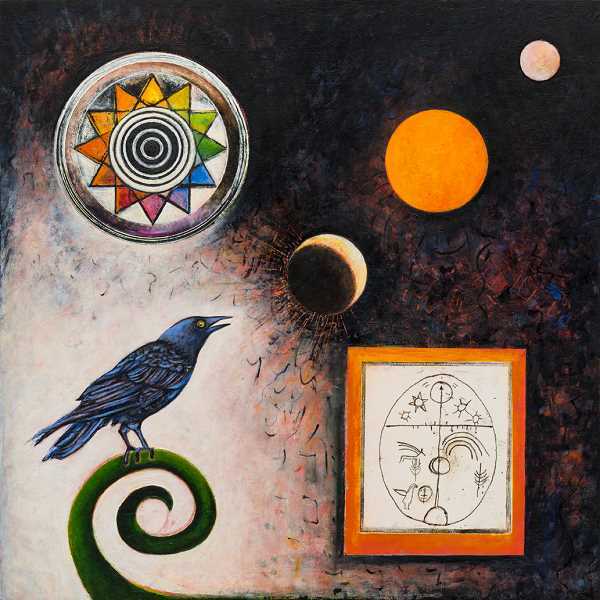 While working on two similar oil paintings of an owl and a crow resting on a perch with a view of outer space lurking in the background, Lisa Brinkman heard a "hoot hoot" sound from outside her home in West Linn. She subsequently rushed outside and found familiar faces — the two animals she had brushed onto her canvases. "It was uncanny and it seemed as if some things came into play when I was working on it," Brinkman says. "The moment participated with the experience of creating the art. It was synchronistic." 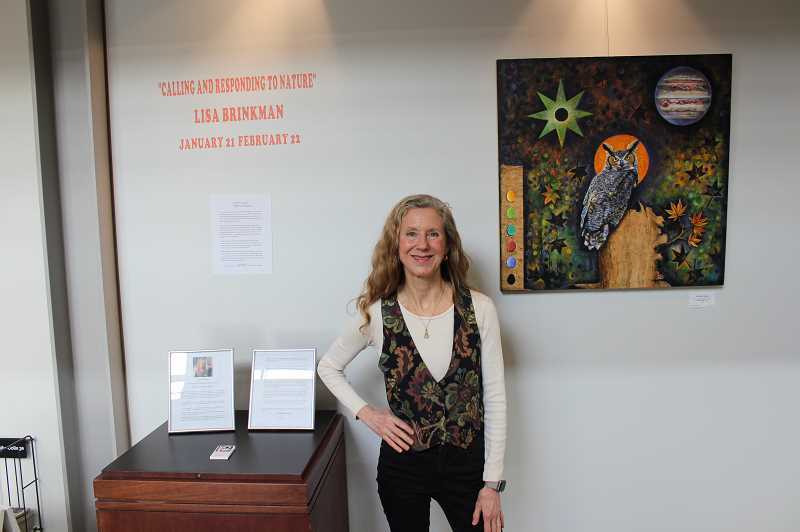 The story encapsulates Brinkman's worldview and new art exhibit "Calling and Responding to Nature," which is on display at the Clackamas Community College Wilsonville campus until Feb. 22. She believes in the synchronicity of the universe and that natural materials and animals exude mystical qualities. "I often work creatively with materials that are of the Earth, including plant and animal fibers such as mulberry bark, cattail, silk and wool," Brinkman writes in her artistic statement. "I find the raw, natural fibers embody a life force, a force that can carry messages, tell stories, participate and contribute to the artwork's ultimate creative trajectory." At the exhibit, her work is divvied up into four sections. One section features a set of raspberry, turquoise and purple trees made out of amate-style bark paper, which she fastened onto birch boards, that are surrounded by snakes, the moon and other universal symbols. Another section includes a set of figures with heads shaped like the moon and the sun performing yoga poses. "It reminded me of the women's march in that it is a group of people that have hope and are expressing what they wanted for the future," Brinkman says. The final two sections includes the colorful oil paintings of the crow, owl and other animals coexisting in the universe and mounted oil depictions of the Buddha, all of which have a washed out, antiquated quality. Other than the Buddhas, bright color is a defining feature of the exhibit. "After I dye something, I was responding to a lot of color and I enjoy color," Brinkman says. Brinkman previously focused solely on mixed oil paintings but branched out into using Japanese and Mexican papers. The exhibit features all of these styles and more. "There's something very luscious about whether it's Japanese paper or a Mexican bark paper or silk fabric," she says. And Brinkman's artistic work is rooted in and inspired by her intellectual studies. She regularly contributes to Cosmos and Lagos's Journal of Myth, Religion and Folklore. "I like studying myth and folklore," she says. "Paying attention to the essence of an image and its roots that often go back to other cultures. That's something I've always enjoyed." Astrology and archetypes have been particularly strong areas of fascination. And in the exhibit, she tries to capture the essence of archetypes such as the regal owl or the meditative Buddha. "(I've enjoyed) looking at archetypes through the window of astrology," she says. "I kept seeing how they relate to planetary influences and the cosmology around it." Do you know what it means to be an AAA certified auto repair facility?